Abstract : teaching materials listen to stories of children in primary school is only fitting must be adapted to the characteristics of the students and also originated from the contextual issues. This research aims to produce teaching materials in the form of an ideal textbook contains material, training, evaluation, and reflection that include interactive multimedia and aims to describe the feasibility of the level of validity, practicality, the attractiveness and effectiveness of teaching materials products. The study design is used to adapt the development of research procedures Research and Development (R & D) Borg and Gall. Results of the research is the development of teaching materials in the form of the contents in accordance with the basic competence intended. Systematic teaching material is presented in three activities, namely the initial activity, core activities, and activities end. Variety of language presented in theory, texts, exercises, and reflection that uses logical and simple language. In terms of appearance, the letters in the title of each class using four combinations of fonts. In the interactive multimedia type and size of letters using three combinations are combined in the title. The conclusion of this study is developed teaching materials that can be used as a guide for teachers in learning to listen to stories of children in the classroom. Keyword : teaching materials, listening , children's story. PUSPITONINGRUM, Encil. PENGEMBANGAN BAHAN AJAR MENDENGARKAN CERITA ANAK UNTUK SEKOLAH DASAR KELAS TINGGI. JURNAL PENDIDIKAN DASAR NUSANTARA, [S.l. ], v. 1, n. 1, july 2015. ISSN 2579-6461. 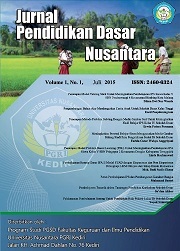 Available at: <http://ojs.unpkediri.ac.id/index.php/pgsd/article/view/151>. Date accessed: 25 apr. 2019.